A writer and speaker, expert on color, style, shape, line, balance, appearance, and communication; Denver area Image Consultant Marian Rothschild has written and has been written about. 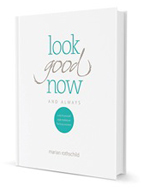 Click here to read our current Look Good Now newsletter in your browser. How to Get the Look You Love (Women’s Magazine 3/11) scroll to page 15. Marian Rothschild, AICI FLC, Certified Image Consultant, fashion writer, personal stylist, Boulder, Longmont, Denver, Colorado.